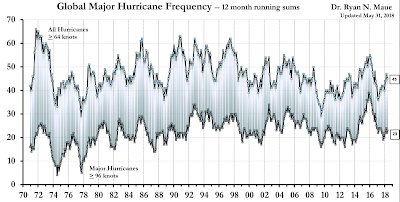 As readers of this blog know, many in Big Climate want us to believe hurricanes have gotten worse as a result of global warming. Their hypothesis and concerns are not justified by the data. I'm feeling a little better today and I wanted to get this important information to our readers. 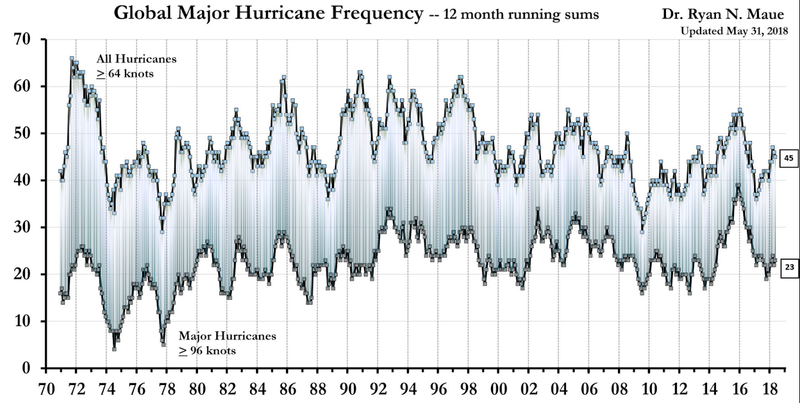 It is freshly updated information from tropical weather expert Dr. Ryan Maue and it computes almost fifty years of hurricane/tropical storm frequency and the Accumulated Cyclone Energy index (ACE) which is the total energy of tropical systems. The upper line on the upper graph clearly demonstrates there is no increase in hurricanes. None. There is a slight increase in tropical storms but it likely that better satellite monitoring is allowing weak tropical storms to be found and named that would not have been the case 20-30 years ago. If you are interested, Dr. Chris Landsea of the National Hurricane Center has done considerable work on this topic. The lower graph depicts worldwide trends in the ACE index in the upper line and northern hemisphere in the lower line. We again have the issue of some additional contribution in later years due to better oceanic monitoring. 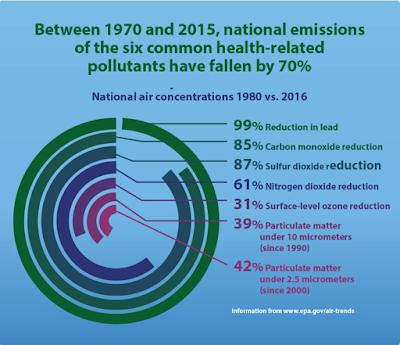 There is a bit of an upward trend in both the hemispheric and worldwide ACE data but how much of this is due to better monitoring and how much, if any, is due to a changing climate is hard to discern. What can be confidently stated that Big Climate's proclamations that the hurricanes of 2005 (Katrina, Rita, Wilma, etc.) were the "new normal" have been absolutely falsified. Sometimes we do not notice good things. Yes, as the author of this blog (with occasional co-authors), I received the legal notice about notifying readers about cookies, etc., that you are now undoubtedly seeing on other sites. Notice that you did not get the cookie notice here because there are no cookies with the blog. There is also no advertising with this blog with the exception of my books. Think of how pleasant it is not to have popups or other annoying advertisements! So, in return for the value I hope you feel you are receiving from this blog, I'd like you to consider purchasing one or both of my books; Sirens or Warnings. Both books are highly rated by readers and will make great summer reading. 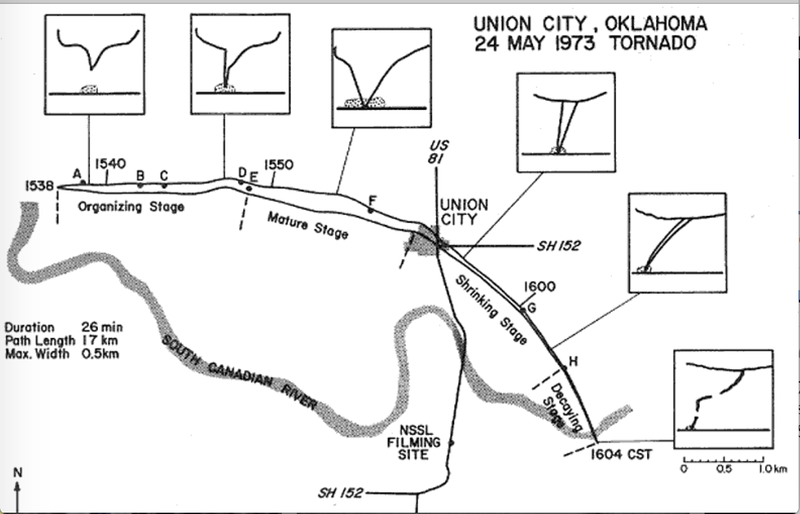 I was reminded earlier this evening that it is 45th anniversary of an exceptionally important storm: The Union City, Oklahoma, Tornado. We probably learned more from this tornado than any other single storm in history. 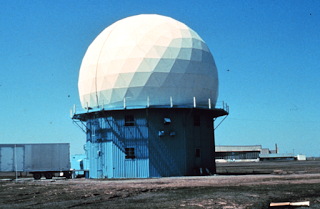 While a Weather Bureau experimental radar in Wichita demonstrated Doppler radar could be used to detect tornadoes in 1958, that analog Doppler was completely impractical for real-time storm diagnosis and warning. In the 1970's, the National Severe Storm Laboratory (NSSL) ran two Doppler radars, one in Norman and the other in Cimmaron, Oklahoma. 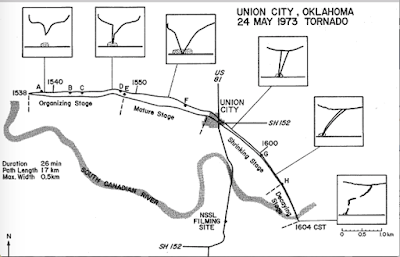 The Union City storm was in the perfect location to be tracked during its entire life-cycle by both. One radar tracking the storm would have been a step forward. Two meant, for the first time, a 3-D mapping of the winds could be done. The year before, the first organized storm chase program in history began. For Union City, there were two chase teams that intercepted and documented the storm. We learned about the life-cycles of supercell-type tornadoes from those photos and accounts. Union City Tornado soon after it touched down. Map of tornado and its life-cycle. Deployment of Doppler radar network across the United States. 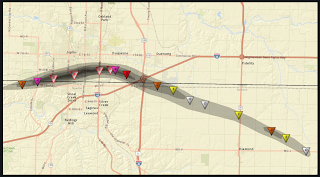 Value of storm chasers and trained storm spotters' contributions to tornado warning decisions. Separating supercell tornado life-cycles from the other types of tornadic storms. The above have all lead to much more accurate tornado warnings. 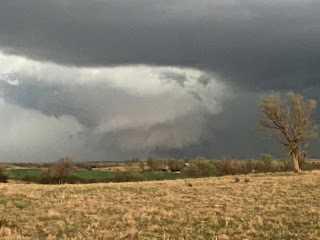 I was one of those early tornado chasers but I was out-of-town that day, so I was not one of the chasers who skillfully intercepted the storm. 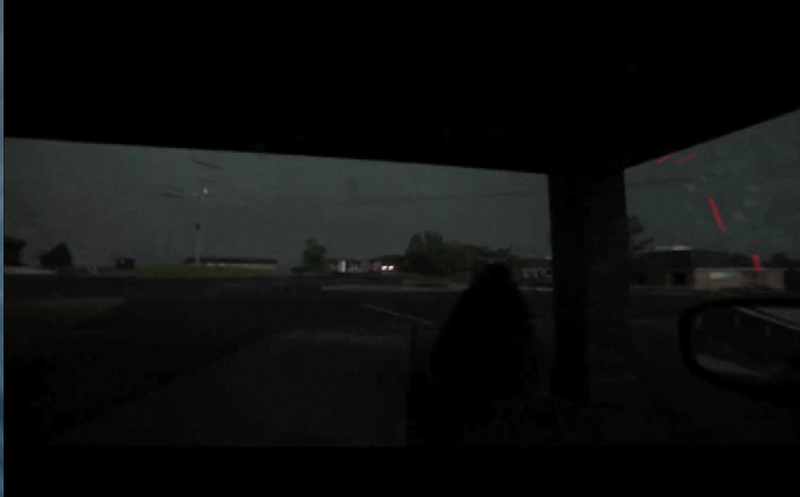 Joplin tornado, 5:35pm, before reaching the city. Photo taken from behind by the Basehunters. Today is the anniversary of a terrible, terrible occasion: the Joplin Tornado of 2011. There were 161 people killed. The number of deaths was inflated due to issues with the warnings; it was the worst failure of the warning system since it began in the 1950's, and due to the fact the tornado could not be seen as it moved across Joplin (the photo above was taken from behind). 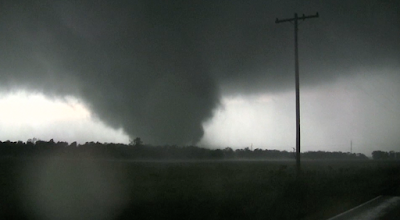 The photo below was taken from the path of the tornado looking right at the tornado. It was invisible. 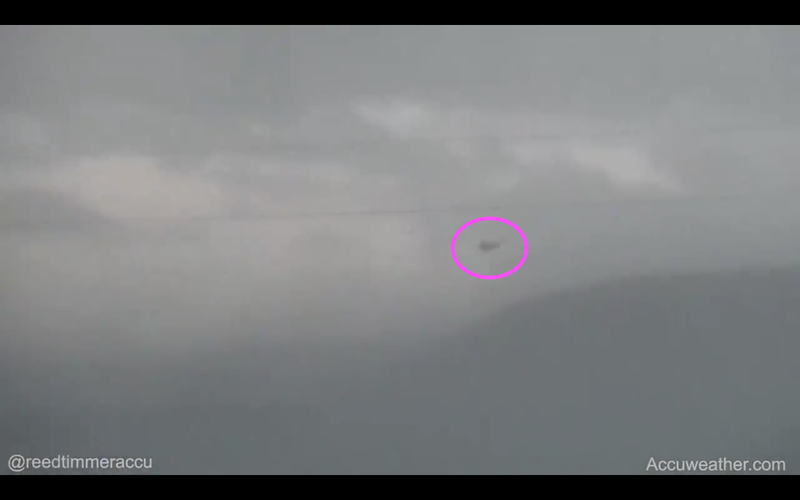 People could not see the tornado coming nor were they receiving an effective warning. The story of what went wrong is in my book, When the Sirens Were Silent. It is a dramatic story that illustrates how to make sure nothing like this happens again. Sirens also contains comprehensive tornado safety rules for home, for schools and for businesses. Sunday is the 100th anniversary of one of the most unusual events in the history of meteorology: The third of the May 20th Codell, Kansas, tornadoes. They are so unusual most all basic meteorology textbooks mention them and many popular publications have written about them, including Readers' Digest and many others. 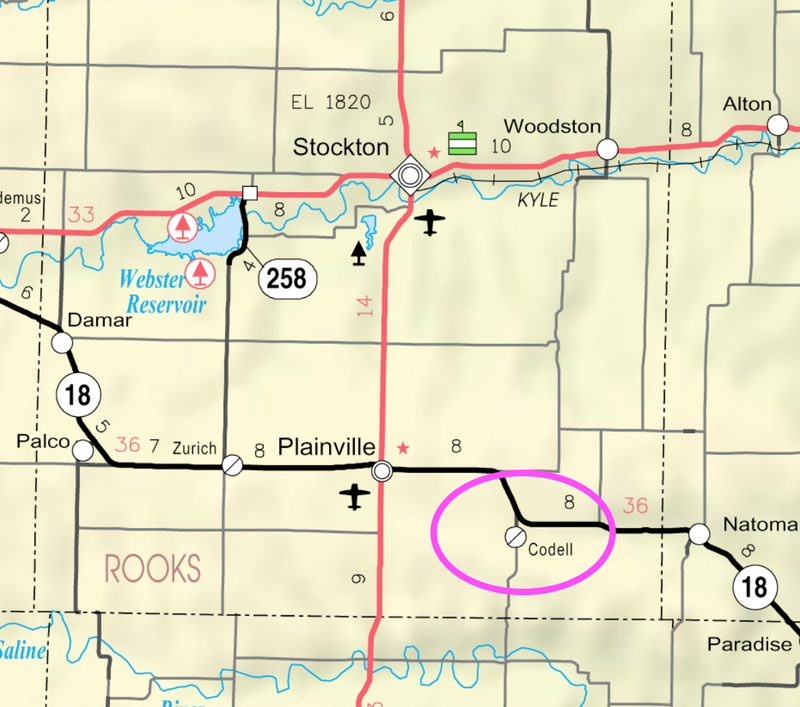 Think about it: A tiny Kansas town of 150 hit by tornadoes on May 20, 1916; May 20, 1917; and May 20, 1918! 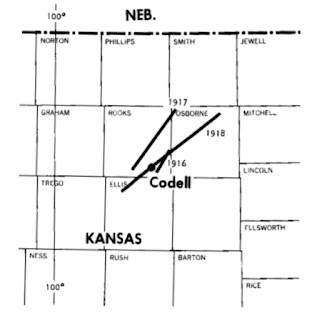 Codell, in north central Kansas, north of Hays, was a bustling town along the Union Pacific Railroad early in the 20th Century. It had all of the trappings of a prosperous small town in America at the time of the first tornado: passenger railroad service, bank, hardware store, hotel, churches, grocery store, lumber yard and even an opera house. 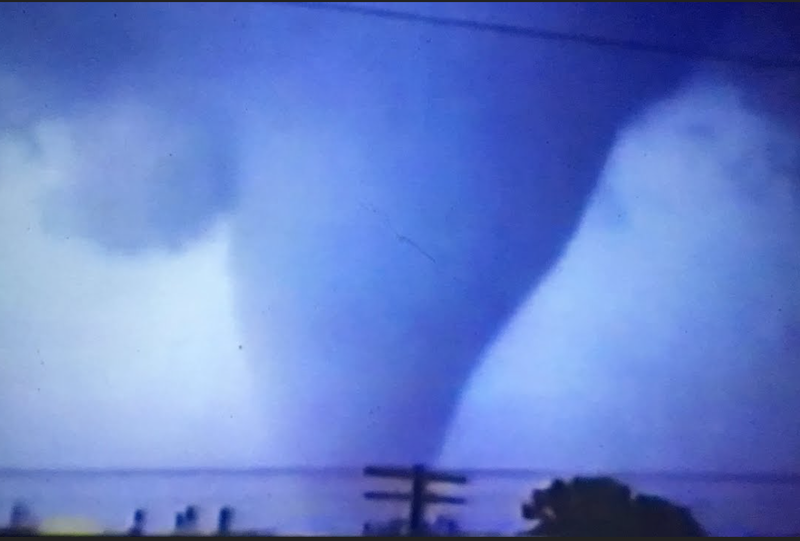 I learned all this when I visited the town and interviewed the late Howard Hockett, a survivor of the tornadoes, for a 1977 article in Weatherwise magazine. He told me, and historical records confirm, the first two tornadoes missed the heart of the city. Here is the list, with the Fujita F-Scale intensity rankings. The survivors told me they called them "cyclones" at the time. 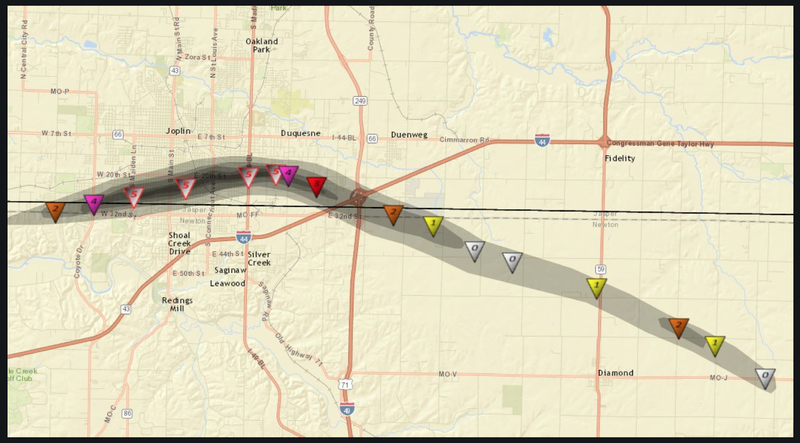 Below, courtesy of Weatherwise, is a map of the path of the three tornadoes. 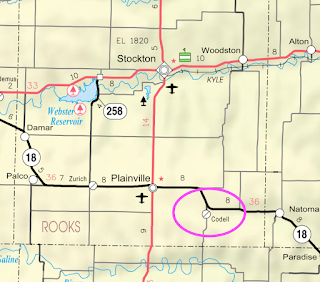 The dot was the center of the town. 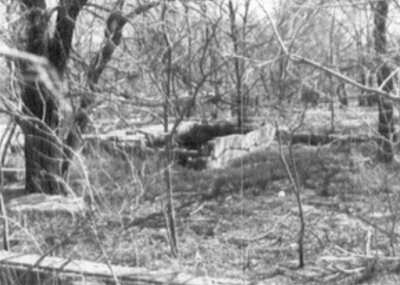 A number of buildings were not rebuilt after the 1918 storm. 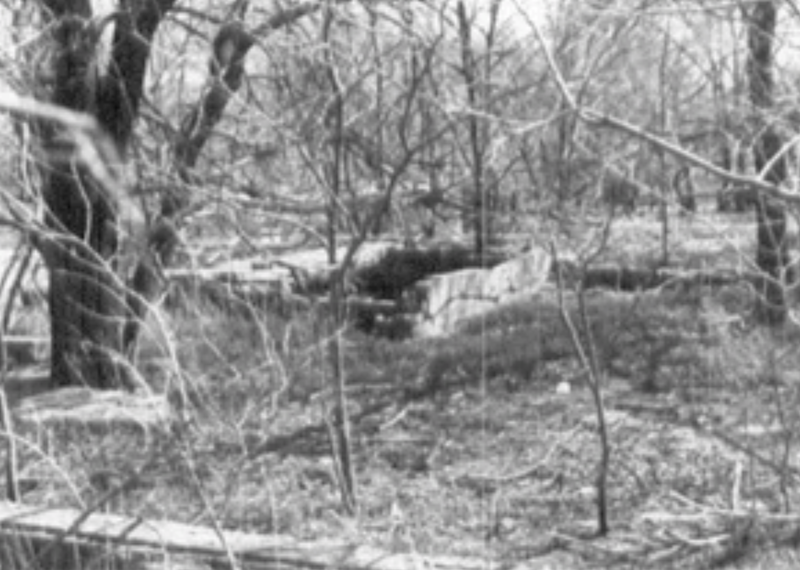 Remains of Codell's Methodist church as they appeared when I visited in 1977. It was one of the buildings not rebuilt after the 1918 tornado. According to Hockett, the legends the town emptied out immediately after the last tornado or that people after the 1918 tornado spent every May 20 in the basement are false. Howard did say, "But, we were sure aware of what day it was!" The erosion in the town's population and its prosperity started after the 1918 tornado, but, according to Hockett, the Great Depression and the difficulties for the town's bank are what really caused the decline. Today, about 50 still live there. 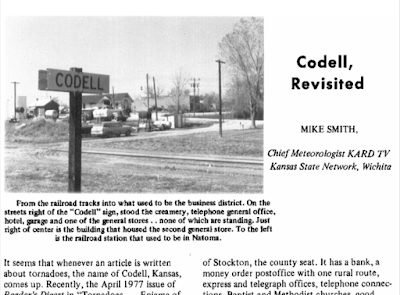 A great article about current residents of Codell is here. 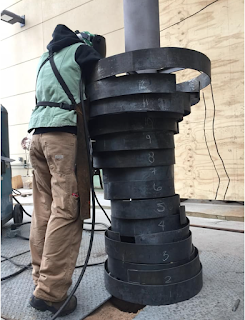 I was pleased to learn a memorial is being erected and will be dedicated Sunday. Mrs. Ellen Hockett, 106, and also a survivor, is expected to attend. 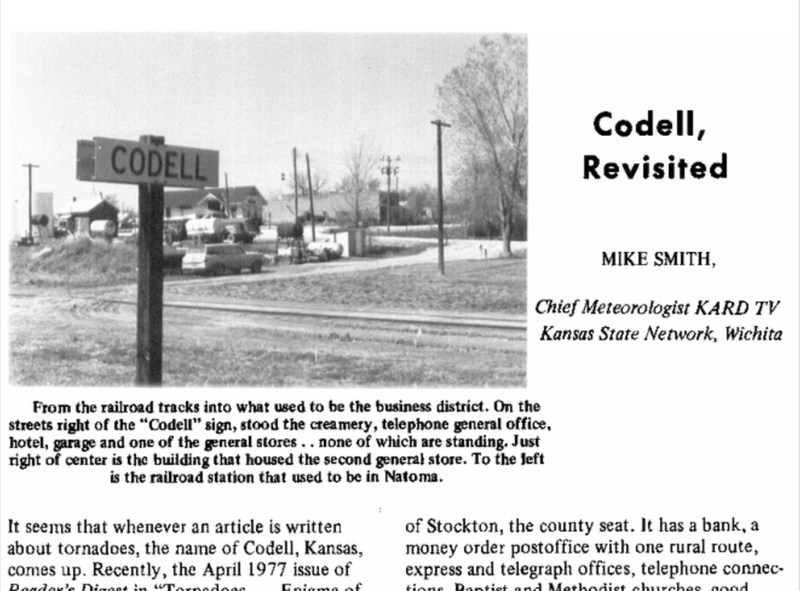 I'd like to close this article with best wishes for the dedication ceremony Sunday and by wishing Codell a tornado-free future. Drones, like kites, will find any tree in the area. I know Barry well and I worked with NOAA for 47 years. NOAA desperately needs his visionary leadership. Please read more here, then email your Senators. 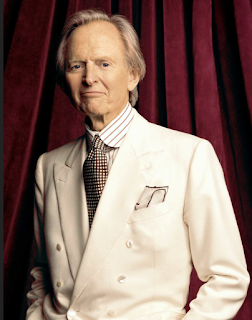 I was saddened to read of the passing of the great American author, Tom Wolfe. He was a giant of American literature. His The Right Stuff is my favorite book along with the movie of the same name. Since angels are depicted as wearing all white, Tom won't even have to change clothes in the afterlife. It would take us back to the 1880's. A newly declassified government report. Happy Mother's Day to all of my readers. I am blessed with wonderful parents. This photo was taken on Mother's Day last year and I want to thank my Mom for all she has done for me and for our family. I would be nice to watch a national newscast without a ridiculous allegation pertaining to global warming. 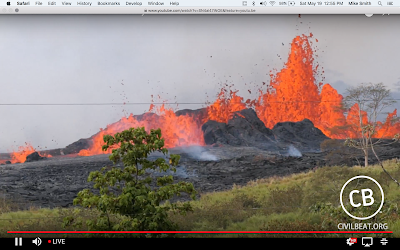 This was on NBC Nightly News Wednesday. So, global warming-caused warmer-than-average spring temperatures that caused more pollen? Apparently, NBC News couldn't even read the newspaper headlines from the same day as their broadcast. This is not a "mistake." If all of these were genuinely mistakes they wouldn't all be in the same direction -- making global warming seem worse than it is. 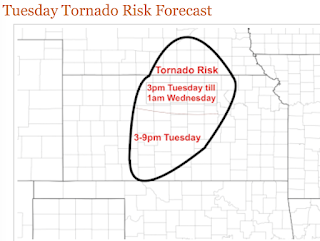 The longer range meteorological forecast data indicates that the potential for tornadoes, severe thunderstorms (large hail and damaging thunderstorm winds) and flash floods will increase from this weekend through at least the end of the month. 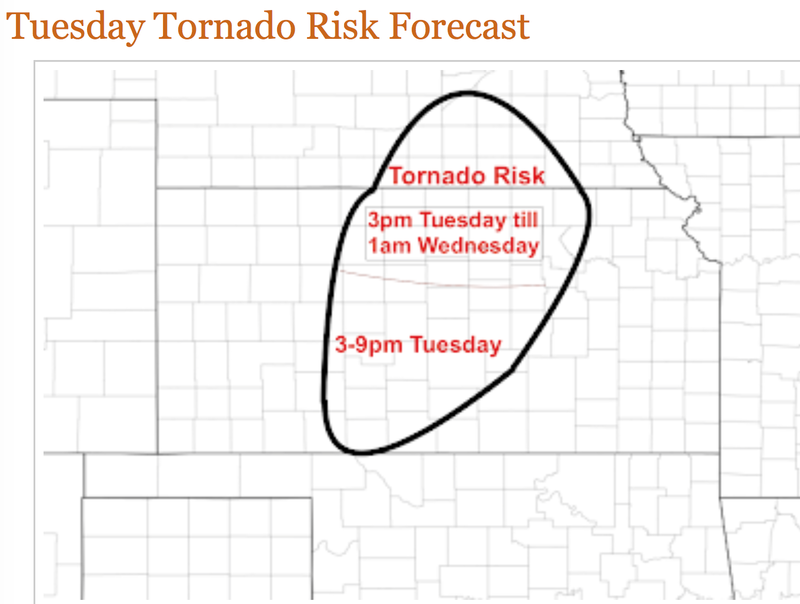 That does not mean these storms will occur every day. Plus, beyond about five days, we can't pin down locations. 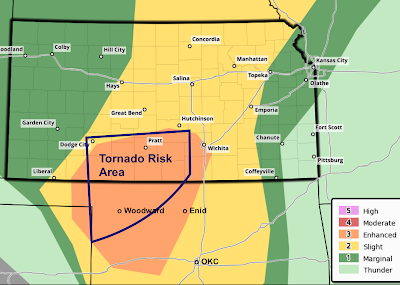 This "heads up" is simply to point out that our exceptionally mild 2018 tornado season to-date is going to quickly come to an end and it is time to prepare in earnest for tornado and severe storm season. 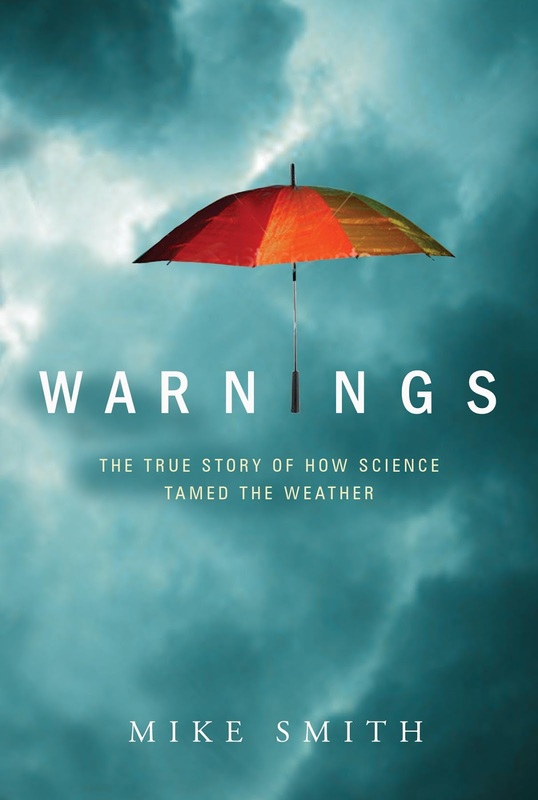 I wish to recommend my short, easy-to-read book that will help you prepare for these violent storms. 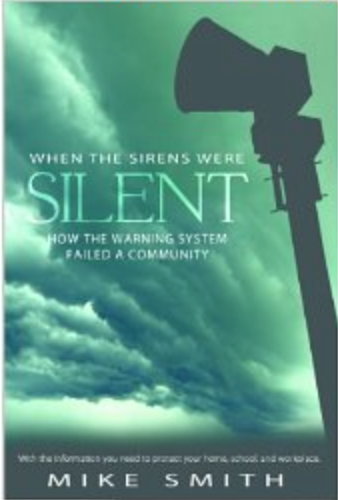 When the Sirens Were Silent provides tornado safety rules for school, work and for home. It tells the story of the 2011 Joplin Tornado. One-hundred sixty-one were killed because the warning system failed to properly perform that horrible Sunday. Sirens tells you what went wrong and how to avoid those issues going forward. All of this is packed into a compelling 65 pages. Nook, or on your computer with Amazon's free Kindle Cloud Reader. The time to get this life-saving information is now, not when a dangerous storm is bearing down on you. Storm chases aren't entirely about violent storms. They are also about seeing spectacular Kansas skies. These photos were taken a May 1 in central Kansas. 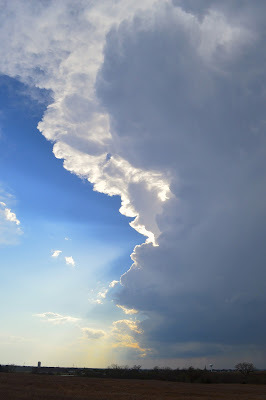 The photo above is a cumulonimbus cloud seen west of Hoisington, Kansas. Below are hail streaks southwest of Hoisington, Kansas. Supercell thunderstorm west of Great Bend, Kansas, with the 2018 winter wheat crop in the foreground. Tornadoes are well known for the sounds they make. Turns out they also make infrasound which might be used in the future to warn of their development. Yes, a dust devil can disrupt your baseball or softball game. Watch this!! The Washington Post does it again. They have sadly surpassed the New York Times in overhyped global warming coverage. 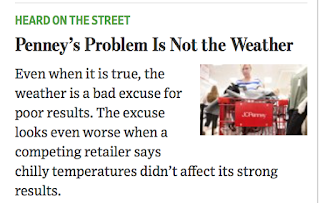 The Post used to have excellent weather and climate coverage. 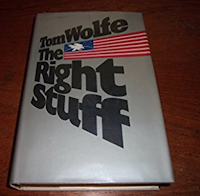 Unfortunately, it has drifted leftward during the Trump Administration even though weather should be about as non-political a topic as one could get. May 5 is National Train Day. 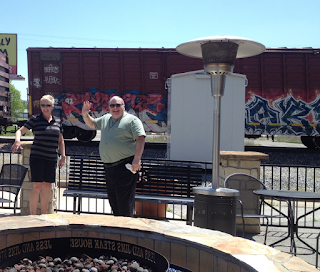 In keeping with this special occasion, my brother, his wife, Kathleen and I had lunch on the Jess & Jims Patio in Martin City, Missouri. 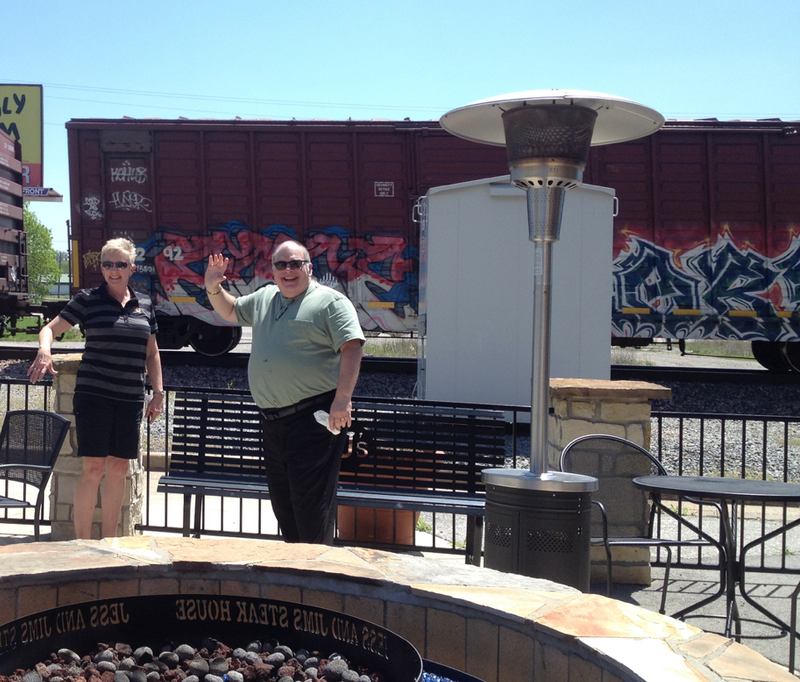 Our friends at the Union Pacific put on quite a show for us! Sister-in-law Robin is the good looking one! Hope you waive to a train today!! ...The Atlantic. It is quite optimistic about Wichita and Kansas' future and our contribution to the national economy. Tescott, Kansas: "Most Fortunate Town in the Universe"
Someone(s) in the town of Tescott, Kansas, has been living right. The map below is the Alma, (a/k/a Topeka) Kansas, WSR-88D Doppler wind data. 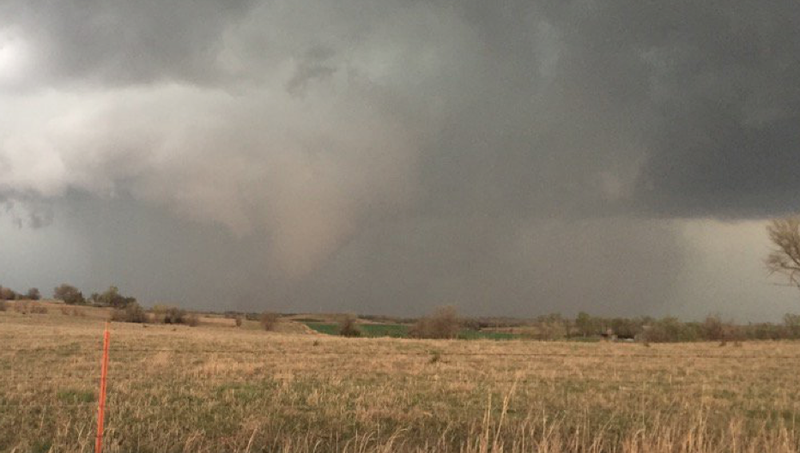 Wednesday, a tornado of moderate (there are no 'minor' genuine tornadoes) intensity passed two miles NW of Tescott (left). 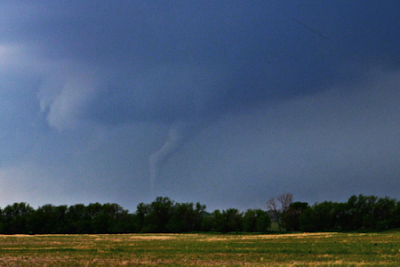 Tuesday, the strong tornado I chased (story here) passed just one mile southeast of Tescott (right). That tornado has been rated EF-3 which means it was a strong tornado. I believe it may have been stronger than that. One of the weaknesses of the EF-Scale is that unless a tornado strikes substantial structures, it cannot be rated higher than a 3. Of course, we are very pleased the tornado missed the town (and the chance at a higher rating). 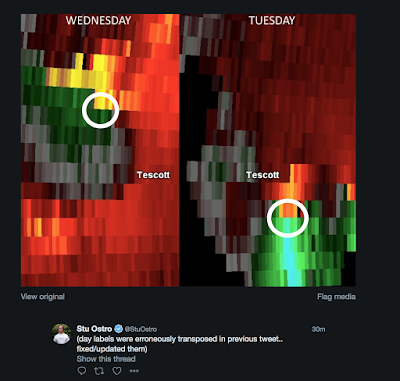 I am going to do a more comprehensive posting about Tuesday's chase and the corresponding radar in the next few days. Courtesy of Dr. Roger Pielke, Sr.
First man,"Looks like we might have tornadoes later today." 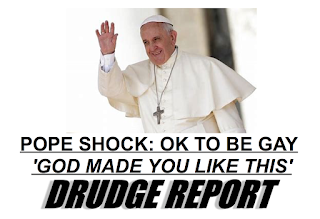 Second man, "Aw, those weathermen don't know anything; must be nice getting paid for being wrong all the time." This attitude is not just annoying to meteorologists, it is dangerous. 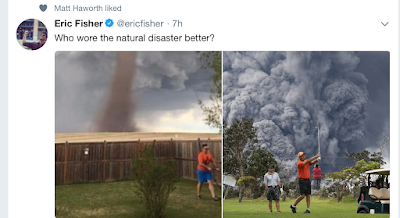 If you do not believe meteorologists are skillful at forecasting tornadoes, you are less likely to prepare and then shelter when a warning is issued. So, how good or bad was yesterday's forecast? And, from the SPC, the red dots are where tornadoes occurred yesterday. As far as I can tell, every tornado was in the tornado forecast area. 21 for 21 tornadoes. The forecast was posted on this blog at 9:50am. Again, per SPC, the first of the tornadoes occurred at 5:37pm: nearly 8 hours of advance notice! Am I boasting? Yes! But, there is a bigger point. Meteorologists are quite good at forecast tornadoes. When a watch is issued, please begin paying attention at the first sign of the approach of a thunderstorm. Then, take cover if a warning is issued. Kathleen and I had an amazing storm chase today. The first part of the chase was rather frustrating with many small funnel clouds (at the left side of the lowered cloud base known as a "wall cloud"). 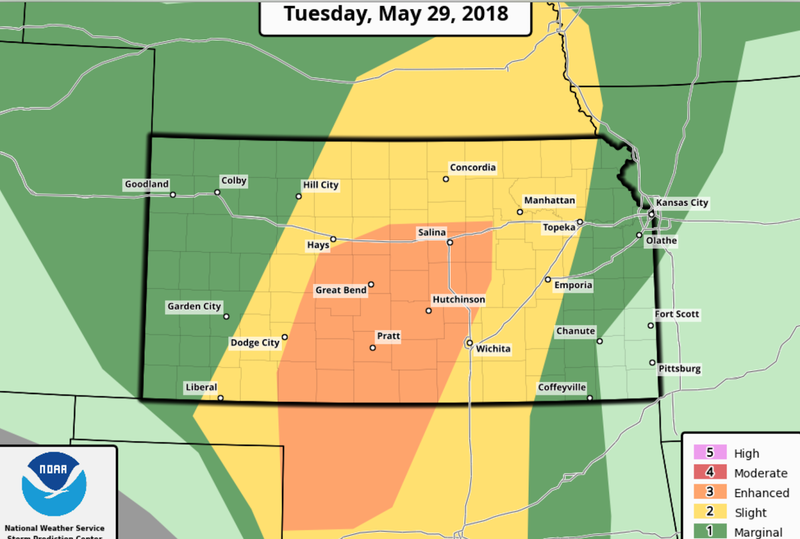 However, things got more serious as the storm approached Interstate 70 west of Salina. 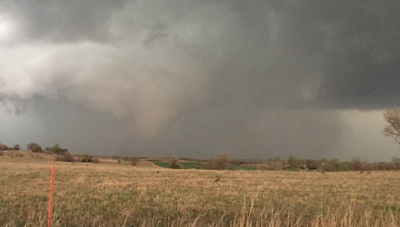 I saw a tornado about 5 miles north of the highway (MM 232) at 735pm (no photo, I was driving). We got off I-70 and went north on Brockville Road and saw a multi-vortex tornado rapidly develop. 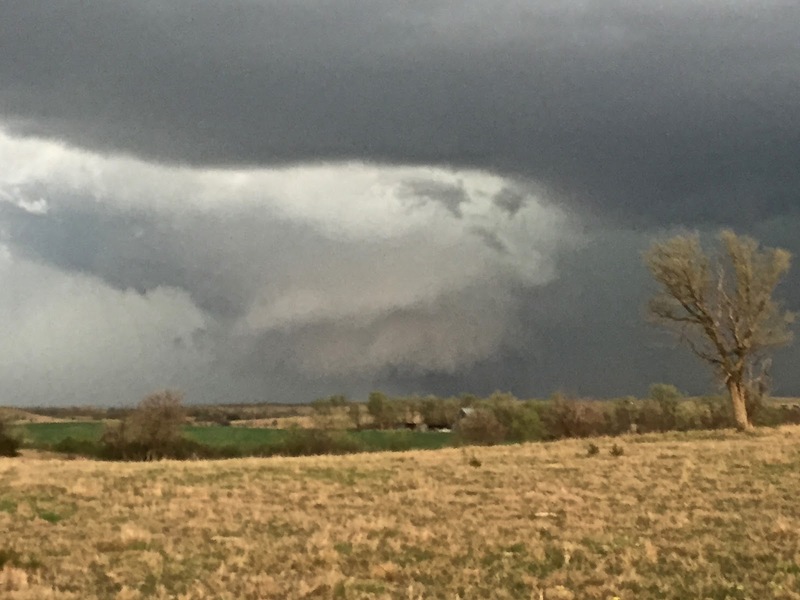 It rapidly widened and increased in intensity as it moved northeast. 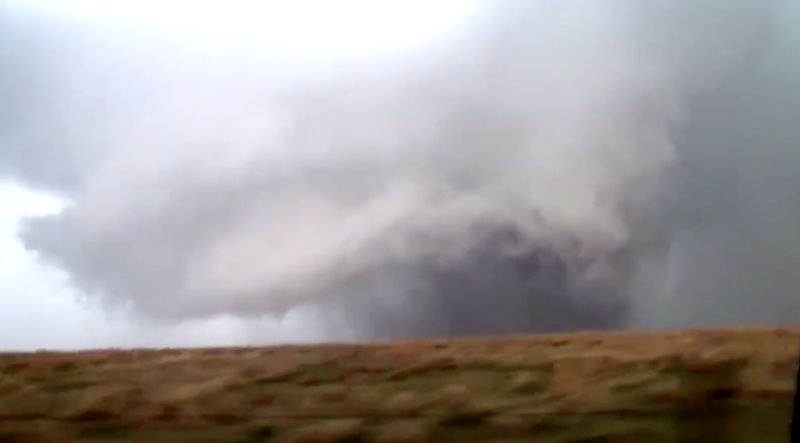 The video below shows the very rapid rotation in the wall cloud and the tornado which appears as a black smudge under the right side of the wall cloud. Click on the arrow. 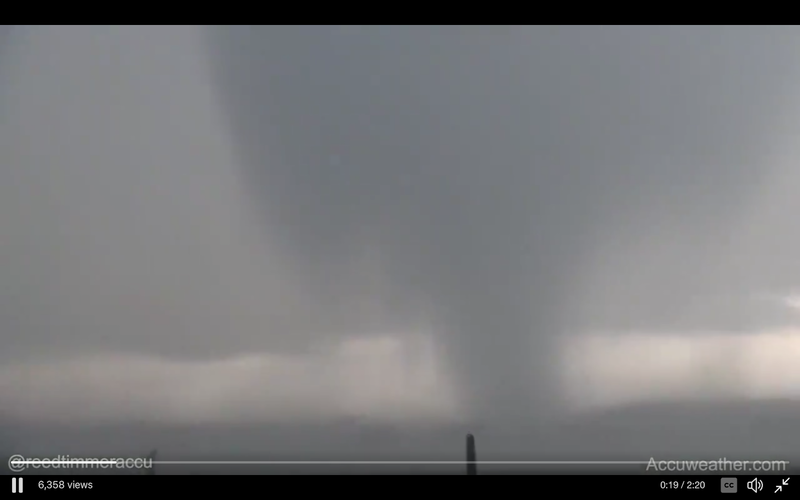 My friend, Reed Timmer, of AccuWeather, got the tornado at the same time from a different angle. 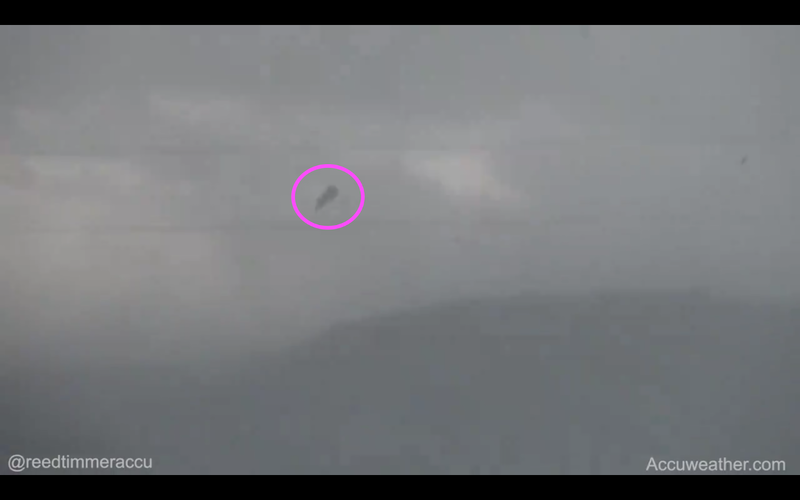 Again, the tornado is the black "smudge." Here is a spectacular closeup about this same time. Unfortunately, the tornado was doing damage. You might wonder, why do this? For one thing, to warn people. I sent many tweets in real time used by AccuWeather, the media, the NWS and my Twitter followers ( @usweatherexpert ). The other is to see the beauty of the Kansas sky. I'll do a posting with some of the great cloud photography we got today when I have time. 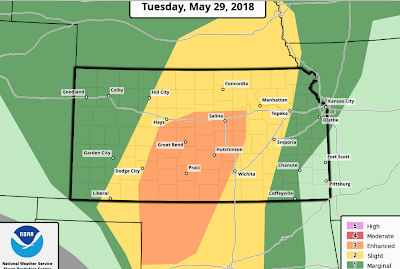 Tomorrow, Wednesday, will be another day with tornadoes in the Great Plains. I'll post on that in the morning.